I bought this copy of Shine at National Bookstore-Greenbelt 1 branch. Copies are still available and currently on sale. You can buy a copy of this book for Php75.00 only. These 35 ideas are taken randomly from a highly engaging book “SHINE: How To Survive And Thrive At Work” (2011) by Chris Barez-Brown. 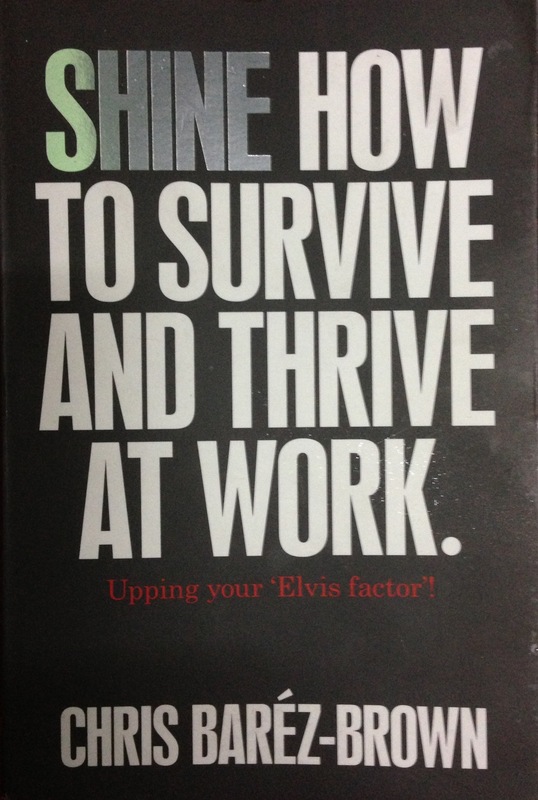 Shine is an exhilarating new guide to loving your work, and living your working life to the full. For Seth Godin, this book doesn’t read, it buzzes. This has always been Bono’s (U2 lead singer) opening question everytime he goes to any organization as part of his well-publicized mission to eradicate Third World debt. According to Brown, the Elvis, who Bono is looking for, is the person who stands out, breaks the rules, makes things happen, shines more brightly, and probably love every minute of it. Brown believes that you can be a bit more Elvis. You have all the ability to stand out. Understand that you are amazing. You have no limitations but the ones you impose upon yourself. You have all you need to shine. Have an abundant thinking. When you embrace abundant thinking you soon realize that people want to be near you. Slow down. To truly shine, you need to tune yourself into you…To do that you need to slow down and take a deep breath. By breathing deeply you feed your brain more oxygen, which it needs to function well. Perception flip. If perspective is everything, you need flexibility and awareness in how you perceive. Make distinction between a good perspective and a stuck one. Be human and screw up. Go with the flow. Find a wave that helps you, and ride it. Go somewhere else. Do something that helps you relax and opens you. Make sure you notice when the people you work with are great. And appreciate them for being so. Make it personal. Know your North Star. If at work you don’t know where you’re going, chances are you’re just warming a seat. Assume everyone is an angel. Instead of imagining your life, live it. Do something real and try something out. Get fresh. To get fresh, you have to break habits and do things differently. Mess with everything. This keeps your brain fresh and your creativity pumping. Life will never be dull. Surround yourself with interesting people. Don’t use your position to control others. If ain’t fun, stop doing it. When we are doing something that we enjoy it is much easier to be shiny, and time just flies by. Travel. Travel keeps you fresh, tolerant and always open to new experiences. Hang out with resonators, not vampires. Resonators are people that have an energy that is infectious. They believe anything is possible and they believe that everything should be fun. Vampires, on the other hand, love taking energy. Do iconic – making a lasting impression that creates a halo around you. Make friends and dump some. Wear clothes that up your energy, physically and mentally. Wear clothes that represent who you are to the world while still making you feel great. Daydream. Kick back, gaze out of the window and enjoy. Be interested in other people, their struggles and their dreams. Surround yourself with talent that scares you. Be a brand. Be a saleable brand. Do what you love and are great at. Believe. People don’t shine brightly unless they believe the deserve to do so.